Psychologists have said for years how important the parental relationships are during the formative years of childhood. Whether we like it or not, how we interacted with our parents plays a major role in how we approach every aspect of life. If you were blessed to have good, loving, moral parents, chances are life has gone pretty well for you. If not, and like me, you came from a dysfunctional family, then you have probably had your fair share of struggles. People spend millions of dollars every year to attend counseling in hopes of working through their struggles from childhood and past relationships that have left them broken, disillusioned and discouraged in life. Relationships are important! They help to frame who we are and how we handle the life we are in. Many times we base our entire worldview upon the type of relationships we were in as children. If we were alone and abused, then we see our world through a victim’s eyes. If we were loved and encouraged, then we see the world as a place of opportunity. Yes, relationships ARE important, and if we say that we do not need people, that statement alone is quite telling about how we have been affected. The most important relationship in our lives is also Parental. Many people go through life without even recognizing that it is available to them. And many still, who have knowledge that it is possible, don’t see their need for it. What I am talking about is a relationship with God. He is called many names in the bible, one of which is “ABBA FATHER”. What does the word “Father” mean to you? For me, “father’ meant someone who was a workaholic, someone who was critical, and disinterested in family life. My earthly father provided well for us financially and considered his job ‘done’, anything beyond that was an inconvenience to him unless it was something he enjoyed doing himself. A a young child, I quickly tuned into the fact that money and self-service was the most important thing in the family, which meant I was always beneath those two priorities. Now, to be fair, I grew up in the eighties, so this was the society focus of the day- build your career, build your possessions and have fun! Everyone was being told that they could ‘have it all’ . And my parents gave it their very best to see that we had it. The only problem, was that the one thing we really needed, was never pursued or nurtured: LOVE. I am not talking about a surface-type love, I am talking about real love that nurtures the depth of your soul. Whatever our family applied our efforts to always came up lacking, there was always SOMETHING missing. We jumped from activity after activity, belief after belief, searching for something that would fill our need to be loved and accepted. Something that could help guide us through our turbulent life, but to no avail. 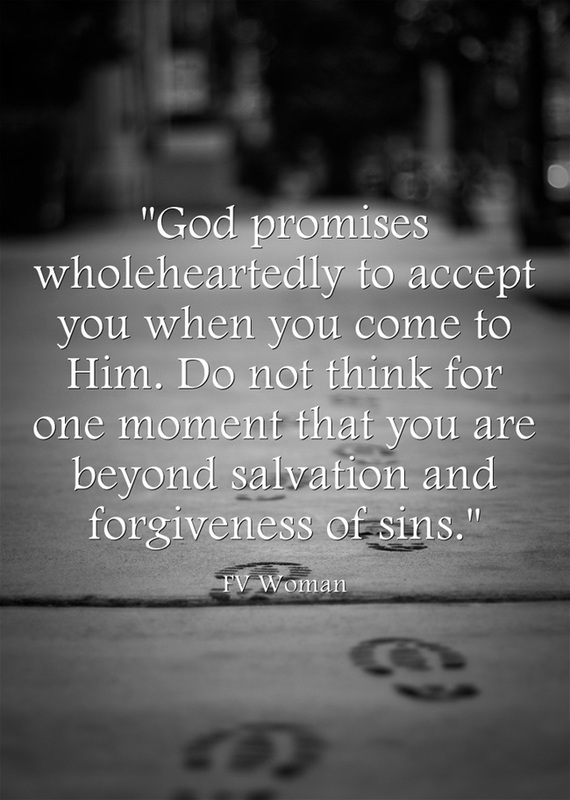 *** He promises wholeheartedly to accept you when you come to Him. Do not think for one moment that you are beyond salvation and forgiveness of sins. Finally, if you have accepted Jesus as your Lord and Savior, we want to rejoice with you! Send us a comment through this website and we will pray for you as you begin your journey! Let God be your Father, let Him show you what a Parent is supposed to be and soak it up like a sponge! You will never regret your decision!